The Mount Agung volcano on the Indonesian tourist island of Bali erupted Monday evening, ejecting a 2,000-meter-high (6,560-foot-high) column of thick ash and hurling lava down its slopes. 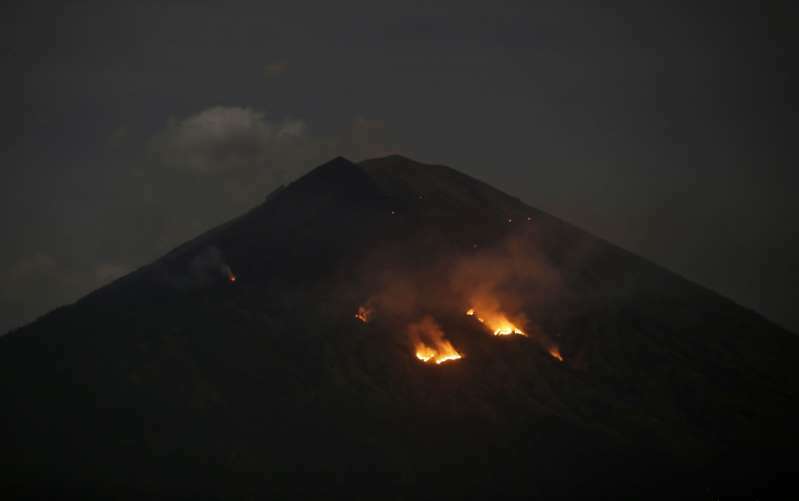 The Indonesian geological agency's Agung monitoring post said explosions from the mountain began just after 9 p.m. and lasted more than 7 minutes. "Flares of incandescent lava" reached 2 kilometers (1.2 miles) from the crater, it said, setting fire to forests at high elevation on the mountain. Nearly 700 people fled Banjar Galih village, about 6 kilometers (3.7 miles) from the crater, to an evacuation center, said a resident, Ketut Budi. [post_ads]"I saw smoke rising and the volcano rumbled very loud," he said. "We came here with motorcycles and those with cars helped carry other people." It was the volcano's first explosive eruption since a dramatic increase in activity last year that temporarily forced the evacuation of tens of thousands of people. The alert status for Agung has not been raised from its current second-highest level and the exclusion zone around the crater remains at 4 kilometers (2.5 miles). National Disaster Mitigation Agency spokesman Sutopo Purwo Nugroho said the explosions Monday night were "thunderous" and hurled white hot rocks from the crater. The volcano was periodically erupting ash Tuesday, which was drifting west. The island's airport, to the south, was still operating normally. Bali's international airport closed for half a day on Friday because of volcanic ash from Agung, disrupting travel for tens of thousands. The island is set to host World Bank and International Monetary Fund meetings in October. Monday's eruption was "strombolian," the geological agency said, which is the mildest type of explosive volcanic eruption. It warned people living near rivers to exercise caution, particularly in wet weather, because of the risk of fast-moving flows of muddy volcanic debris. The volcano, about 70 kilometers (45 miles) northeast of Bali's tourist hotspot of Kuta, last had a major eruption in 1963, killing about 1,100 people. Authorities lowered its alert status from the highest level in February after seismic activity quietened. Indonesia, an archipelago of more than 250 million people, sits on the Pacific "Ring of Fire" and is prone to earthquakes and volcanic eruptions. Government seismologists monitor more than 120 active volcanoes.